The superb mystery author P. D. James was often asked to write a short story or novella that was published at Christmas and other times in various magazines and collections. 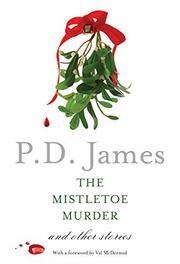 The Mistletor Murder and Other Stories, published after her death in 2014, was the first collection of four of these stories to appear in book form. It is a delightful grouping, with all the plotting skill, humor, and exceptional writing that marked her career. There is nothing like a good murder mystery at Christmas time, and here are four great ones!